Merchandising, POS, and WMS, to improve your user experience, sales, and profitability. Software Quality is imperative for a Retailer’s success. Being leaders in Independent software testing services, Cigniti brings in “the unbiased” quality engineering approach, “custom-built” retail testing frameworks & solutions, and a “dream team” with strong domain expertise delivering value to its clients. From aligning the right strategy to the right implementation of the software testing approach, Cigniti’s proven successes and domain expertise in Retail Testing enable multi-channel Retailers to transform their businesses through a results-driven approach in Quality Optimization. New Generation Retail has undergone a dramatic transformation, thanks to the evolving user behavior making it imperative for retailers to adopt innovation in technology and operations, while ensuring a superior user experience and being ultra-fast in going to market. This has changed the way IT applications and technology for retail industry are not just perceived but developed, supported, and run. Cigniti assists retailers (individual as well as large chain retail) in assuring quality across their enterprise applications, leveraging Cigniti’s IP BlueSwan while minimizing the costs and risks. 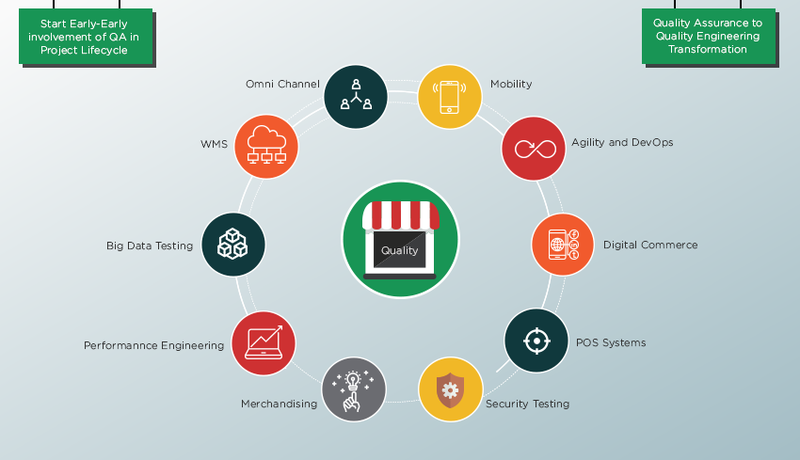 Cigniti’s end-to-end testing processes for retail industry help you in supporting your initiatives of enterprise re-platform/upgrade/migration/set-up of complex integration between latest CRM, OMS, WMS, Cloud, Mobile, and Web Applications. Cigniti’s balanced approach aligns business and end-user needs in one compelling retail solution. From Food to Fashion to eCommerce, we have worked with top players in the industry on Digital Quality Engineering for Retail Industry. Our Comprehensive Service Offerings span across the entire retail and digital commerce ecosystem with our dedicated domain experts having more than 10 years of retail and digital Commerce expertise providing strategic consulting. Flexible Engagement Models: Cigniti’s diligently designed engagement models help our retail clients to manage their risk and balance their resources and cost strategy for testing needs. Scalable and flexible engagement models offered to our clients help us deliver the most pragmatic solutions in the industry. Strong Expertise in Retail Domain: Delivered value with help of our Domain Competency Group (DCG) and Retail TCoE reducing QA effort and cost to our customers. Cigniti’s domain knowledge, and Product and Tool expertise in retail complement the engineering team and strengthen our testing service offering. These resources have diversified expertise and experience in testing different utility applications/products implementation, upgrades, migration and/or enhancements. Test labs for Compatibility, Mobile, and Security: Cigniti has cloud-enabled test labs for compatibility testing, performance testing, and mobile application testing to tune into ever increasing demands of retailers. We also establish dedicated test labs for clients with additional security measures that can be audited by client teams. Time and Cost reduction: Cigniti has translated its learning, experience, and expertise into a next generation proprietary software testing platform – BlueSwan – which is leveraged by clients to accelerate and reap immediate benefits of Quality Assurance early in the software lifecycle. These tools help our Retail customers in identifying software defects early on from requirement phase and aid in optimizing test combinations within the complex cross-channel integration environment. Enterprise Test Accelerators: Cigniti’s accelerators can be used exclusively by Retail clients to jumpstart test automation leveraging a tool agnostic automation framework and a Reusable object repository. Cigniti’s automated end-to-end testing services in retail, focusing on POS, Merchandising, CRM, and WMS, amplifies the user experience in stores and contributes to improved sales and profitability. Leveraging Retail and Digital Test Center of Excellence (TCoE) and Domain Competency Group (DCG), Cigniti has created ready-to-use Enterprise Test Accelerators and solutions across different platforms in the retail domain. These accelerators are enablers, which reduce testing efforts by over 70%. Cigniti’s Retail TCoE emphasizes on translating end user’s requirements into new business opportunities. Cigniti has forged strategic partnerships with multiple tool vendors to give our clients best in class software test automation services ensuring continuous testing. This enables our clients to accelerate the release of applications into production and sustain continuous feedback and improvement across the software lifecycle. With the right mix of Commercial and Open Source tools, we bring in the best possible solution to give you a Collaborative development and Continuous testing environment.